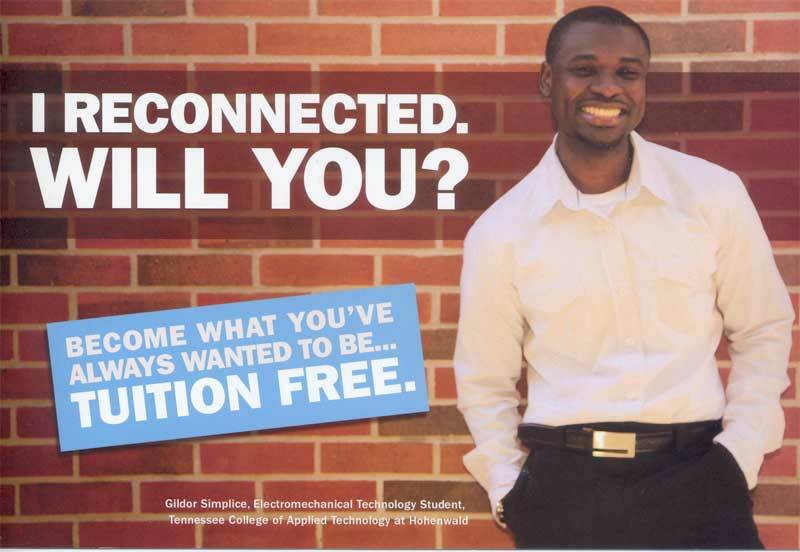 TN Reconnect provides eligible adults the opportunity to earn a diploma or certificate at a Tennessee College of Applied Technology (TCAT) free of tuition and mandatory fees. 1. Sign Up for the Tennessee Reconnect Grant by May 15. 2. Apply to your local Tennessee College of Applied Technology (TCAT) by May 15. 3. File the FAFSA and visit your local TCAT by June 15. 4. Enroll in a program and launch your future. Applies to students enrolling on or after July 1, 2015. Current Students will be eligible to receive Reconnect beginning Fall 2015. Eligibility – Students must be Tennessee residents for one (1) year and determined to be independent by the FAFSA. Students that have a certificate, diploma or degree that have never received a Reconnect Grant are eligible. All other eligibility rules of Wilder Naifeh apply. Last dollar scholarship – Tuition waivers and discounts are applied first then gift aid (TELS, TSAA, and Pell only) will be paid toward tuition prior to awarding Reconnect. All other financial aid may be used toward books, special course fees, tools etc … and do not impact the Reconnect award. Enrollment – Students must be enrolled in a full-time program. Supplemental programs are not eligible for Reconnect funds. Application – The Reconnect “sign-up” form on the website is for marketing and planning purposes only. The annual “application” required for this program is the FAFSA only. Deadlines – Students must complete the FAFSA by the same deadline as Wilder Naifeh for each term. There are no other deadlines for Reconnect. Terminating Event – Graduating with a certificate or diploma. Students may receive only one Tennessee Reconnect Grant. For more information visit www.tnreconnect.gov.